Belated Happy New Year 2016. Belated Happy New Year 2016! OK. I know. I’m sorry. It’s April now, and I’m back. To blogging that is. I know it’s a long time since my fingers touched the blogging keys on my computer, but just wanted to wish all of you, wherever you are, a very Belated Happy New Year 2016. Our Christmas was gentle, full of family and friends, and the excitement of having our big new room to play around in. But our thoughts couldn’t help but be with the people suffering around the world, and those in our country having their homes and lives shattered and soaked by the floods. May 2016 be a better, peaceful and dry year for all. So what’s happening in East Yorkshire for us in this new year, 2016? Quite a lot, I hope. Didn’t we just all start the New Year with masses of resolutions, but gradually forgot them as the year progressed! Here are just some of our hopes and projects we are aiming for this April – let’s see how many we have achieved by the end of this year. Lose weight and get fit – OK, boring I know, and I bet most of us are doing this. Fingers crossed we manage it!! 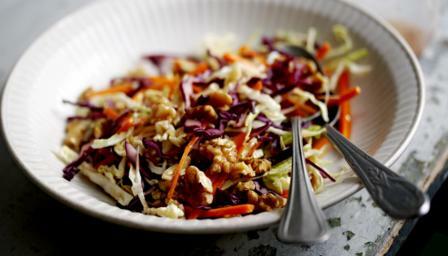 Watch out for masses of healthy but tasty recipes coming your way. Tidy up and make beautiful the garden outside our new extension – it was slightly trashed by the building work, but shouldn’t take too much effort to make it better (hopefully). Started to seriously think about coming up with a viable and final plan for our new kitchen, in our fabulous new garden room. Our fabulous new empty room. First Christmas in our new room. Take the big Armoire out of the garage, clean it, paint it, make new shelves and fit glass panes in the door plus internal lighting then plead for the neighbours’ help to carry it into our new big room, to house lots of glasses, tableware and kitchen ceramics. Fit shelving into the garage so that, instead of precariously tramping up the metal ladder into the attic, we can store some things in the garage instead (in big plastic boxes with tight lids, so that little creatures can’t make nests!). Move further on with our kitchen plans. 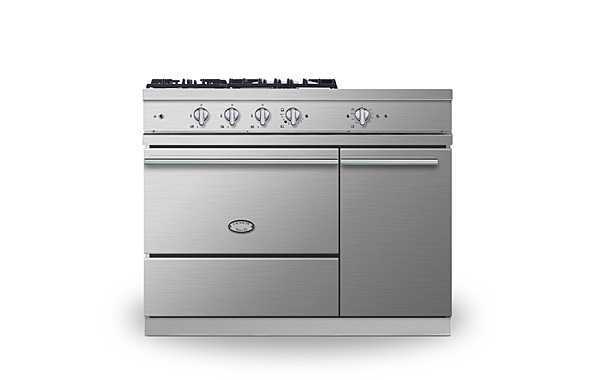 Make big decisions on range cookers versus fitted ovens, fridges versus big fridge freezers, dishwashers – whether to splash out on a wall hung grill/salamander – how big to make our kitchen island – all those sort of of lovely decisions that I thrive on. Depending on how far we get with the kitchen, work out if we can afford a greenhouse, which we urgently need to help us in our kitchen garden. Tidy up the kitchen garden (it needs some love and attention), and work out what to grow this year. 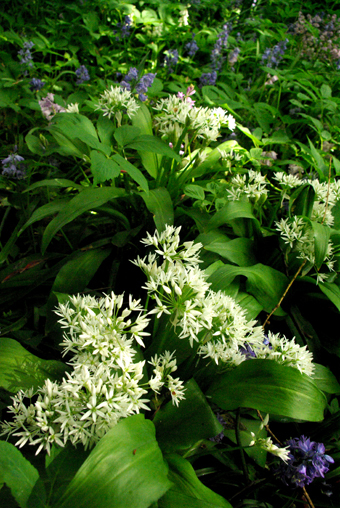 The Wild Garlic is once more overflowing, the beautiful star-like white flowers opening their petals as we speak, and the scent of garlic gently lingers in our woodland area. We inherited a small patch, and then I sowed a lot of the tiny garlic ransoms in our woodland area, which this year are spreading rapidly. I’m so thrilled. Erik’s thoughts turn to recipes for Garlic Pesto, and I’ve recently read about gently tearing up the leaves into strips to add to the mixture for my Quiches, or to add to a Pasta sauce. Making myself hungry again now! At last I’ve made a start with the kitchen garden, and planted my courgette seeds (three different types), radish, beetroot and celeriac. These seed trays are sitting in our new room at the moment, nice and toasty warm, covered with their acrylic lids, and within 4 days the radish shoots have emerged. Soon I’ll be planting all different types of lettuce in the raised beds, and will be making a trench to prepare for the runner beans. We just need fewer cold nights and more warmer days to get the kitchen garden up and running properly. Looking forward to eating all our fantastic home-grown salads and fruit and vegetables this year. So as you see, we have so much going on this year, which is exciting (well, for us that is). We have hopefully found someone to help us move our kitchen plans further forward. 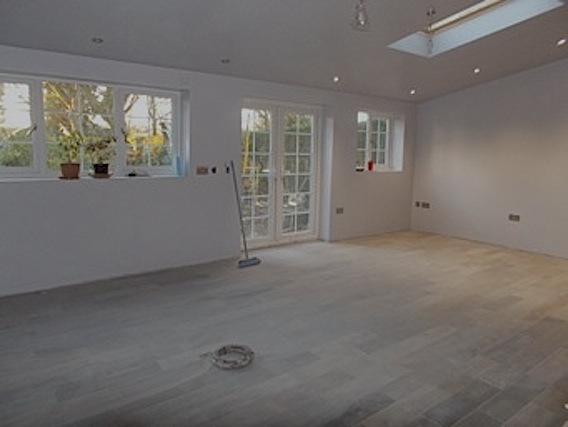 I’ve spent about 18 months, working out what we want in our great new, spacious kitchen/garden room. Everyone who visits us walks into our new space, and says “What a fabulous room – surely you’re not going to put a kitchen in it?” And guess what our reply is? “Yes we are.” But it will be a special kitchen, our kitchen, overlooking the garden, with a table and some squashy seats at the other end, near the french windows. 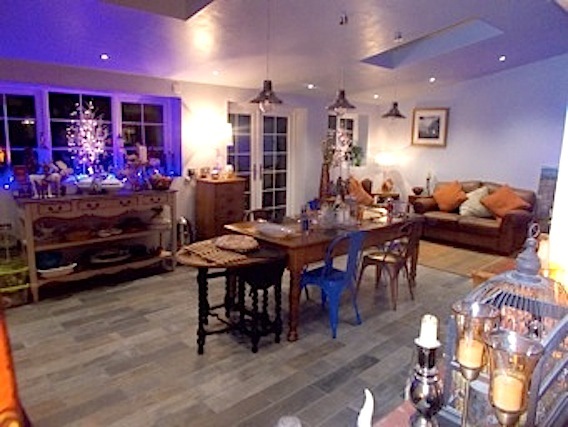 So if you are interested in ovens, kitchens, cooking, growing your own and growing flowers, doing up your house and enjoying the family, stay with us, and see how much fun we are having. So pleased that I’m back into writing again, and love sharing it with you. So once more, sincere apologies for the delay in wishing you a Belated Happy New Year 2016. Let’s hope it’s a good one.